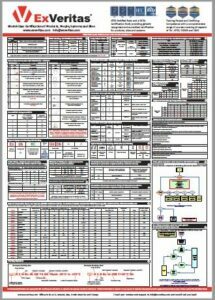 This IECEx and ATEX wallchart is packed with codes, standard and useful guidance on ATEX, IECEx including zones, categories, concepts, ingress protection details, temperature classification details, gas flammability details and EPL’s. Ideal for project engineers, inspectors and equipment manufacturers. Contact ExVeritas now for your FREE IECEx and ATEX wallchart and get the most useful and up-to-date ‘Ex’ information on your wall. The IECEx and ATEX wallchart will only be sent to relevant business addresses, 1 per enquiry please. It is not always possible to send posters to customers outside of the EU. The information must not be modified or redistributed in any way without our prior permission. ExVeritas are an ATEX Notified Body and IECEx Certification Body who provide internationally recognised accredited safety and certification services including IECEx, ATEX, CE Marking and North American Certification. We also offer accredited hazardous area training such as CompEx and site safety services such as DSEAR assessments, area classification, Ex inspection and explosion risk assessments. We produce IECEx and ATEX Information Posters to help users and manufacturers understand the complex codes and markings associated with ATEX and IECEx Certification and Installation. It should be noted however that these codes can change over time and that the user is responsible to ensure the information used is correct at the time.